And you know what that means … Discourse 1.4 ships today! The focus of this release was UI improvements and enhancements, as requested by our customers and active Discourse communities. 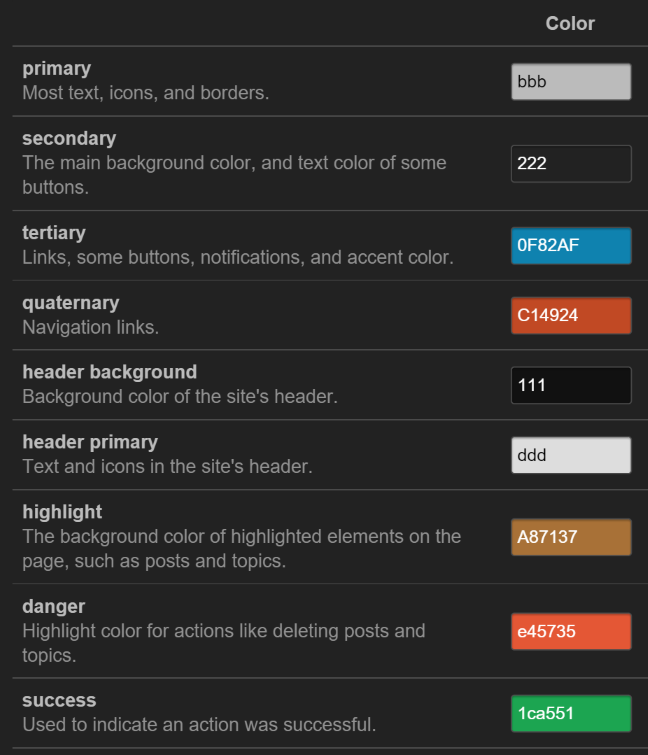 Dark themes worked in earlier versions of Discourse – if you were willing to roll your sleeves up and augment the color selections with some hand rolled CSS. But in 1.4 we switched Meta over to a dark color theme for a week and made sure it worked flawlessly throughout Discourse. Moved like count inline with the reply buttons, so topics with lots of likes are not so vertically expanded. Unified the notifications and user drop down at upper right, so there’s one less glyph at the upper right to make you think. Introduced subtler styling for staff actions in topics, so the conversations are not so visually interrupted when a staff member does something to the topic. We now provide more editor feedback during image uploads (which as always, you can add via paste, drag and drop, or the upload button) and offer better optimized images for reduced bandwidth and storage. On top of that, we now serve default Discourse avatars via avatars.discourse.org, a completely free, CDN based hosting service for our default “letter” avatars that further reduces CPU load and disk space on your Discourse server, while adding the benefits of global caching. There’s now a proper UI for re-ordering your categories, rather than the old method of assigning each one a number. We thought our mobile layout was a bit busier than it should be, so we simplified it. Note that “new” is just a dot on mobile, and we display either the unread reply count, or the total reply count rather than both. We welcomed back Kane York aka riking for a summer internship this year and he did amazing work as usual. One of the features he suggested himself, and then built, is this nifty call to action for anonymous users – after reading the site for 5 minutes and entering at least 3 topics, anonymous users will be presented with a little banner at the bottom of topics inviting them to sign up and create an account! This is exactly the kind of just-in-time action we love to build in Discourse. We now offer a “whisper” feature for posting inline topic replies that are only visible to staff. Enable the feature in your site settings, then use the gear icon in the post editor to indicate when you want to whisper to the other staff members in the topic. We’ve had the ability to embed Discourse (in a read only fashion) in static HTML pages for a while now, but in 1.4 our embedding support is greatly improved – you can style the embedded section via Admin, Customize and you can embed per category, if you want several blogs or sites to feed into the same Discourse instance. These are just the major highlights in 1.4 — there are literally hundreds of other tiny improvements, refinements, and bugfixes in 1.4 that we aren’t covering here, but are in the full release notes. As usual, we’d like to first thank our customers for your support, and the overall Discourse community for their many contributions toward this release — whether it was in pull requests, feedback on meta.discourse, or our personal favorite, feedback based on user activity in your own Discourse instance. In particular, we’d like to highlight significant pull request contributions in this release from tgxworld, Simon Cossar, gwwar, and gerhard. Yet again, avid meta.discourse user erlendsh created the super cool feature demo videos and screenshots that you see above. For insight into what’s coming up in future releases of Discourse, keep an eye on the releases category at meta discourse. If you don’t have Discourse, install it yourself in under 30 minutes, or get a free 14 day hosting trial! As I mentioned in the blog post – special thanks to @tgxworld, @Simon_Cossar, @gwwar, and @gerhard who contributed a bunch of stuff to this release. Discourse 1.4 represents some Huge Strides to making it the defacto mailing list replacement. I’m excited and encouraged by the development! Look for the “version” parameter in the app.yml file. I’m a little behind here, but thank you for the ability to style embedded sections!